When they met Noel, he conducted an examination and found that Ghost was painful on both of his elbows. He was painful when the elbows were moved and also when the bones were touched. Concerned, Noel explained that the condition could be two possibilities and one much worse than the other. The first possibility was an inflammation of his bone marrow, called panosteitis, which only painkillers would be required to treat and it would likely resolve with time. The second, was a condition affecting the inside of the elbows called developmental elbow disease or elbow dysplasia, which can manifest as cracking away of bone and cartilage within the joints. This could be a much bigger issue, and could indicate corrective surgery. Discussing these possibilities with Hannah and Rich, they were eager for Noel to continue his investigations to find out exactly what the diagnosis was for their lovely companion. No young dog should struggle to run and play, and everyone was eager to find out what was happening to him. Thankfully, X-rays and a CT scan revealed good news – that panosteitis was the problem. 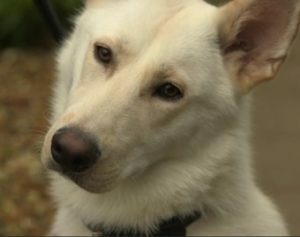 Ghost had white ‘thumbprint’ lesions, affecting both of his legs, which represented inflammation of the bone marrow, and that’s what was making him painful and limping. 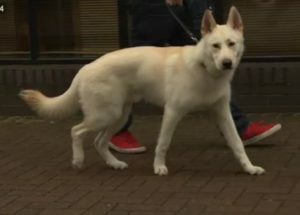 Relieved, Ghost’s family came to take him home, and he was prescribed anti-inflammatory painkilling medication which greatly improved his condition such that he was no longer lame. Hannah and Rich went away with the knowledge their friend was healthy and happy, and the road ahead full of possibilities for running and playing! It’s just lovely when I can give people good news, but it’s very important I feel to be honest with folks and tell them all of the facts and that means telling them the worst case scenario sometimes. Fortunately Ghost didn’t have the worst case scenario. I love it when things are better than they might have been, and better still, I love it when we can be pretty sure that a dog will go on to live a long healthy pain-free happy life. Yey for Ghost!